I have two boys aged 4 and 2 who are mad about diggers. They get excited when we pass a building site, and I think I must have watched every brick being laid when our new Sainsburys Local was being built over the summer. We arrived at Diggerland at 10am on a lovely, warm and sunny Easter Monday. Parking was free and plentiful, and the boys queued up excitedly waiting for their first glimpse of the revered diggers. 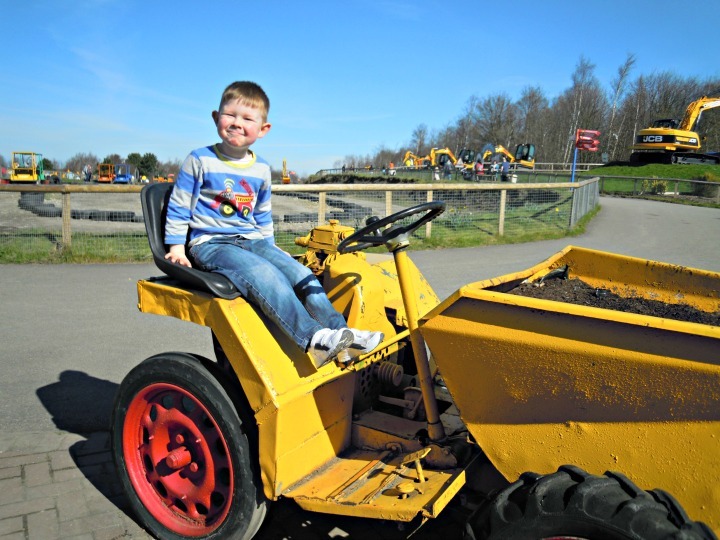 Diggerland Castleford is a small – medium sized park laden with diggers in all shapes and sizes. You can operate a digger and dig a big hole, play hook a duck with the digger, get spun round in the air by a digger, go on a digger train, drive a dumper truck, get taken for a bumpy ride by a digger and even drive one through loads of mud and water (fantastic fun!). There are 18 rides and attractions in Diggerland Castleford and each one of them has interesting facts at the entrance about the size, cost and weight of the rides in question. There are some coin operated rides (dodgems, racing cars etc) which aren’t included in the entry ticket price, but we found there was more than enough to do without using these. Who can dig the biggest hole? First up, was driving our own 3 tonne digger and seeing how big a hole we could dig. The boys were able to sit on our knees as my husband and I operated the controls, and children over 110cm can drive it themselves. There were 2 levers; one for making the ‘shovel’ (non-technical term) go up and down and the other one for opening and closing it so you can lift the dirt in and out. 2 year old Daniel was giggling hysterically and waving to his brother in the next digger as ours shuddered and shook as I attempted to dig a larger hole than my husband. We got to spend loads of time on this ride, and weren’t hurried along by the ride operator which was good. Mission accomplished, we moved onto the next ride which was the Mini Tractors. This is where the children take Mum and Dad for a ride along a little course. We queued up and Daniel was waving to all the people already on the ride patiently waiting for his turn. It was then I noticed that the height restriction of this ride was 1m so he wasn’t allowed on! Cue massive toddler tantrum and tears when he realised he couldn’t go on, but I managed to turn the situation around by fishing out a pack of Haribo from my pocket, and he was soon munching away happily watching Matthew driving Daddy around. 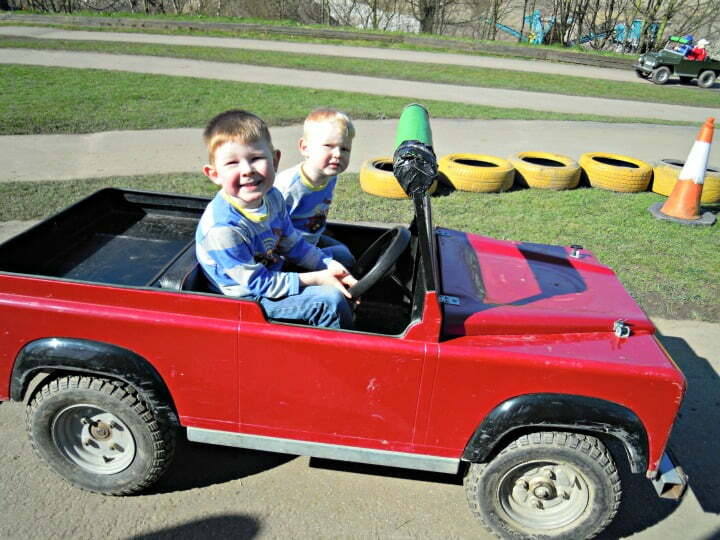 Daniel was allowed to choose the next ride, and headed straight over to the Mini Landrovers. This was a really cute ride where the boys were allowed to go in their own car and Matthew could take Daniel for a little drive. Both of them really enjoyed this and they went on it quite a few times. Matthew loved driving his little brother around, and Daniel loved being the passenger. There weren’t too many other Landrovers on the circuit and they went at a low speed so it was nice and safe. Next up was having a go on the smaller JCB’s and trying to play skittles with them!! You could also play Hook a Duck or Dig for Buried Treasure if that took your fancy. There were 2 levers on this, and myself and Matthew made a good team operating 1 lever each to try and aim the metal ball at the upstanding skittles to try and knock them over. It was a feat of skill, determination and team work, and after what felt like about an hour, we had managed to knock them all down!! Lots of fun. The boys were getting peckish by them, so we headed to The Dig Inn for a bite to eat. It was a nice day and lots of families had brought a picnic with them and were eating them on the picnic tables outside. The restaurant served a mixture of sandwiches, paninis, burgers and a daily special of a filled Yorkshire pudding. There were children’s lunch boxes comprising of a sandwich or a hot meal and a drink for £3.50. All in all, our family of 4 ate lunch for £20 which wasn’t bad. After lunch, we headed off again for more digger fun. Myself and Daniel went on the Dig Around which was a merry go ride digger style –another ride which was suitable for toddlers over 90cm tall. Then we went on the Robots which was fantastic fun. Again, Daniel was giggling away whilst I drove the digger along a mud track and through water (he was asking where the ducks were when we were going through the water!). We were slipping and sliding all over the place, but it was in a perfectly safe environment. Next up was the Go Karts which Matthew loved driving. Daniel couldn’t go on these he wasn’t tall enough but he loved watching Matthew. 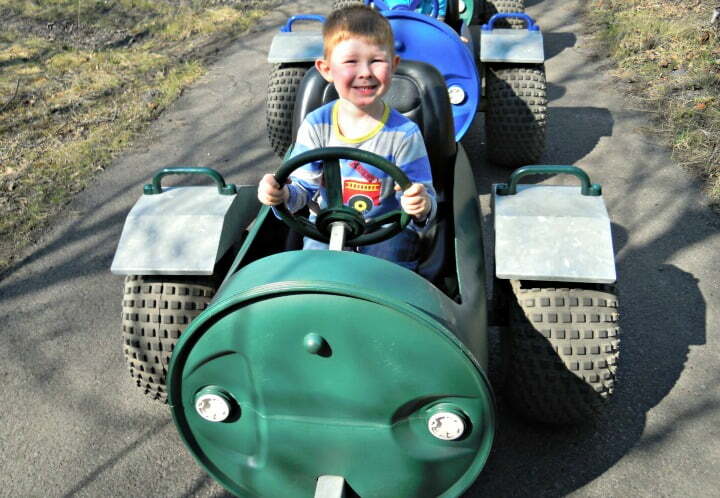 One of our highlights was the Diggerland Train which took us on a tour of the park. The 3 of us sat in the main train and Matthew sat in a train barrel at the back which was like a little carriage pulled along by the tractor. We passed some dinosaurs on the way which the boys liked. By this time, we had been there for about 4 1/2 hours, and Daniel was getting tired, so we decided to head home. There was still a lot which we hadn’t done yet such as the Spin Dizzy (digger lifts you in the air and spins you around), the safari ride in a Landrover, the Sky Shuttle, which lifts you 50 feet in the air, and the Ground Shuttle which takes you for a bumpy ride. We had had such a good day though, and the boys were tired but happy. 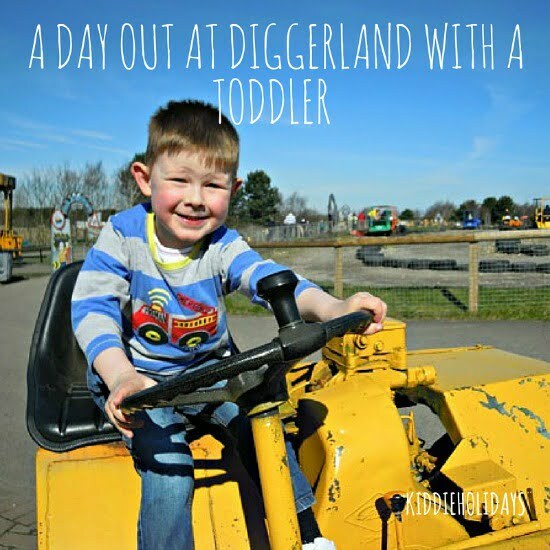 We found there was loads to do at Diggerland with a toddler over 90cm tall. Children less than 90cm tall might not be able to go on a lot, but they will probably like seeing the diggers and you don’t have to pay an entry fee for them. Children over 1m or 110cm can drive some of the diggers, and go on some of the bigger rides but my 4 year old wasn’t bothered about doing this as he thought they were scary. 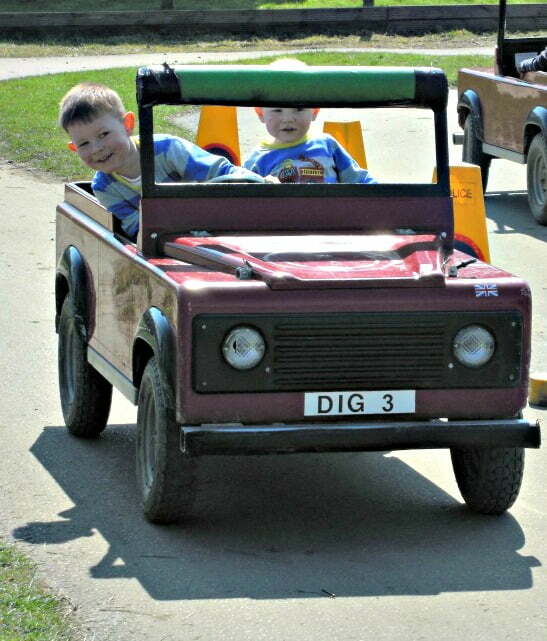 My boys were happy running around, watching the diggers and sitting in the driving seat. I asked Matthew what his favourite part of the day was and his answer was simple – ‘seeing the diggers’! The boys are still digger mad so I don’t think it will be too long until we go again. Matthew on the dumper truck! 1. Get there at opening time and head to the rides at the far side of the park first. Everyone tended to start off at the rides near the entrance so they were busier. 2. The park is buggy friendly, but we didn’t need one as it is fairly compact. 3. Parking is free and plentiful. 4. There are Baby Change facilities in the Ladies Toilets. 5. Book your tickets online before hand and save 15% on the entry ticket. 6. Sign up for the Diggerland email newsletters – they sometime send special offers and discounts out. 7. Go on a dry day. There is an indoor play gym but all of the fun things are outside. Pick a nice day to visit and you will have a lot of fun. 8. Children under 90cm are free. Don’t be put off going with younger children – we found our 2 year old toddler was happy enough watching the diggers and running round. 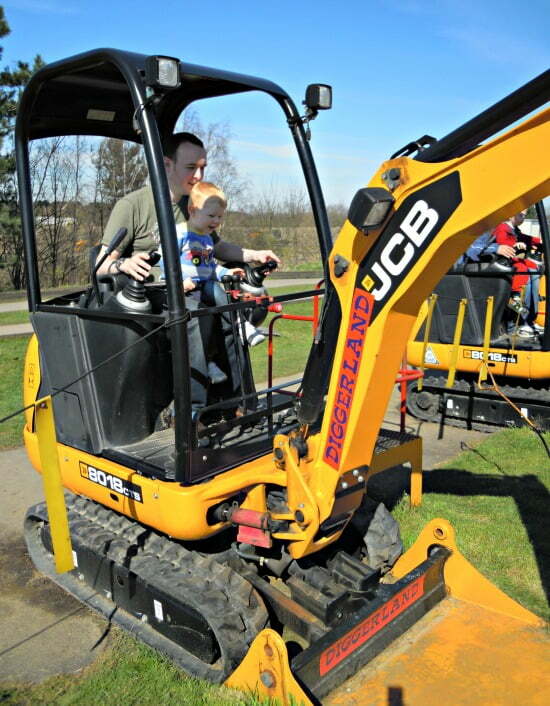 Since thanks to Diggerland for our day – we loved it! Click below to see my video of our day out at Diggerland! Applying For Your Baby’s First Passport – How To Get Your Passport Application Right First Time! Great review Jo! We’re going soon and I was worried about bringing my two year old but I think he would really enjoy it. Good tip about going to the far side of the park first.